At our last house*, I planted several raspberry bushes in the backyard. It was an easy thing to upkeep - the backyard was mostly wooded and I actually had time to tend to the plantings. I had plans to plant some brambles here, too, along the western edge of the house, but just never got around to it. 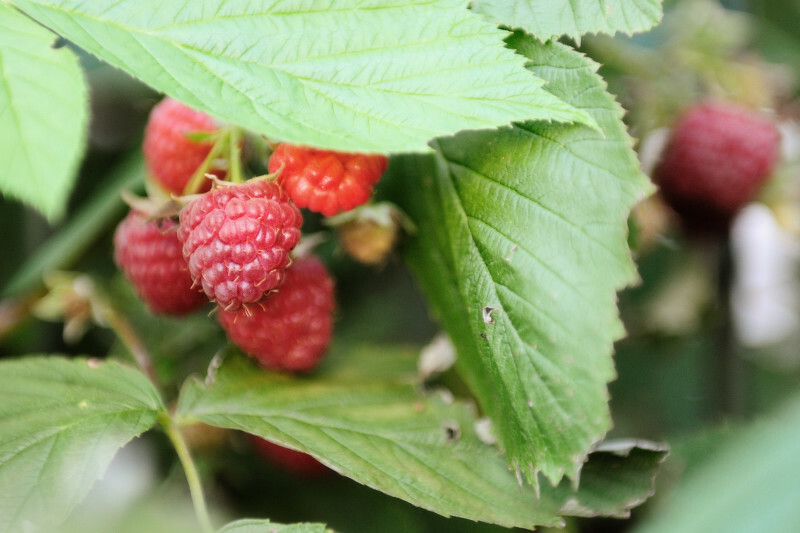 But since my neighbors have planted their own raspberries and have offered up their fruit, I may get my raspberry fix without having to plant my own. Or, I'll get inspired and finally plant my own. * Our previous house in Indiana was sold again, this time to one of our previous co-workers and friends, Elissa and Tom. Elissa reported back to me that this year's raspberry crop is looking wonderful. And I remember being excited to pick a dozen or so berries the first year after I planted them. I'm just glad that the plants are still there, bearing fruit and enjoyment. Fresh raspberries how wonderful! We used to live in a house where our neighbor had a lot of blackberry bushes. He always encouraged us to help ourselves. Blackberries became my daughter's favorite fruit and she still loves them to this day, though nothing could beat picking them off the bushes yourself to eat.